We apologize for the long gap between WaldaBlog posts. 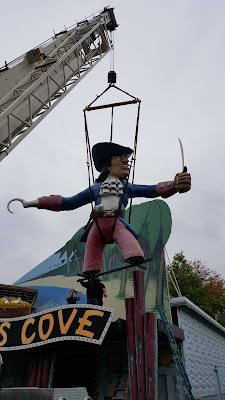 Between finishing the most successful season in Waldameer's history, and the blogger needing to finish school, WaldaBlog sadly had to be placed on the back burner, but now we are moving ahead and WaldaBlog is back to keep you updated on all of the happenings at Waldameer and Water World. 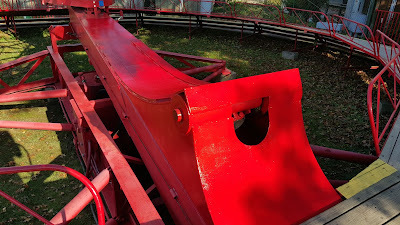 Labor Day may have been the last day Waldameer was open to guests in 2015, but unlike what some may think, Waldameer does not sit idle until May. 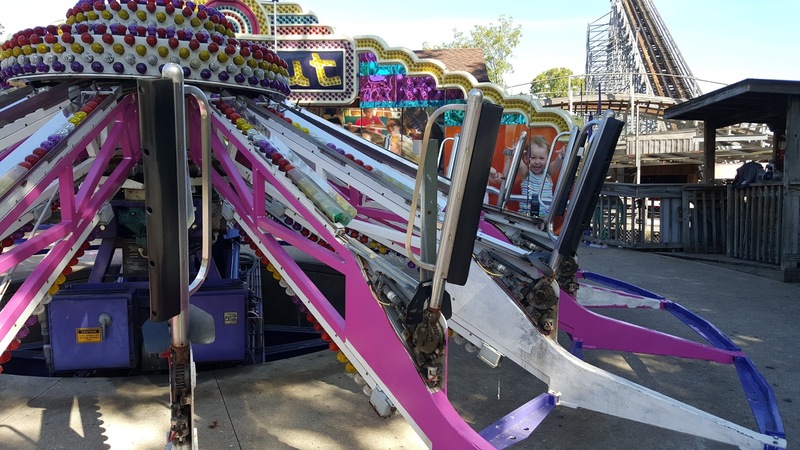 Our small group consisting of maintenance team members, full-time managers, and a few seasonal team members are hard at work preparing Waldameer for 2016. The end of summer and beginning of fall is the perfect time to refresh many rides and attractions with a new coat of paint. These weeks of mild weather make the end of summer and early fall the optimal time to paint and perform upkeep, as in the Spring we must dedicate our resources to setting up attractions for operation. 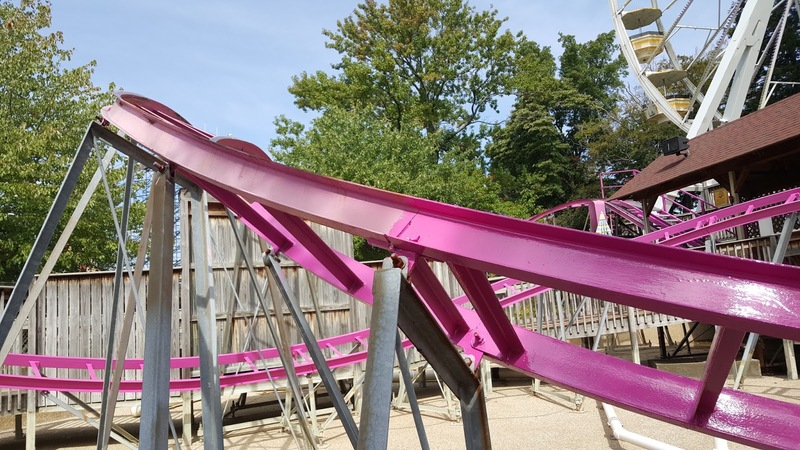 Starting over in Kiddieland, Ravine Flyer 3 is getting a much-needed fresh coat of pink. What a difference a fresh coat of paint makes! Sometimes we like to change things up. 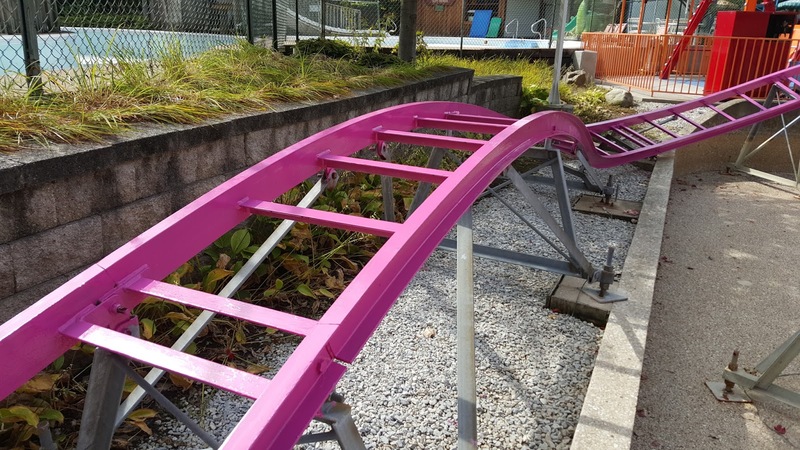 Wipeout will have a groovy new color scheme featuring purple and pink. Once complete, combined with the recent backdrop refurbishment, Wipeout will be almost unrecognizable from just a few years back! From 1995 through 2014, the sweeps and rim were all white. From October of 2015 and into the future, Wipeout will feature pink sweeps and a purple rim. As you may remember from many blog entries back, we refreshed Paratrooper in time for the 2014 Season. Unfortunately the sun was a little too strong making the ride look almost pink, but this fall we are repainting Paratrooper with a new type of paint that we hope will look sharp for many seasons to come. Penny and the "Ride Squad" have been busy. Keep up the great work! Our maintenance team with the help of our friends from Rog's carefully brought the Pirate down from Pirate's Cove. We are looking forward for him to receiving a fresh coat of paint in time for 2016. 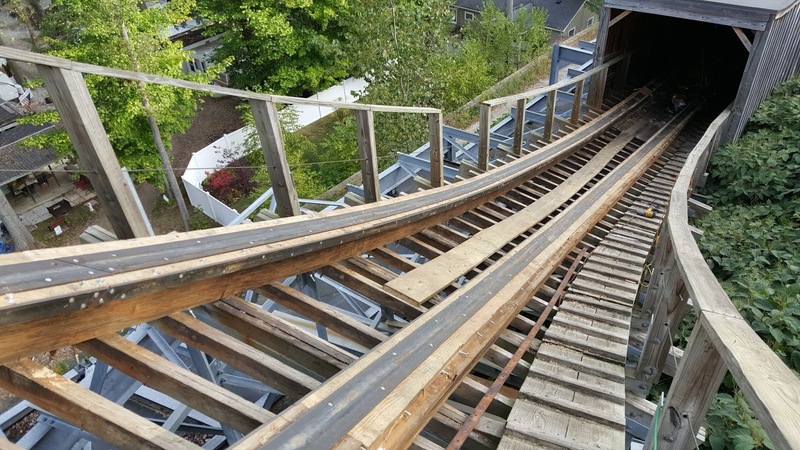 A team of carpenters from Texas spent a month making adjustments and replacing several sections of track on Ravine Flyer II. We are determined to move back to the 6th Spot, or better, for the Best Wooden Roller Coasters (We finished in 7th for 2015). 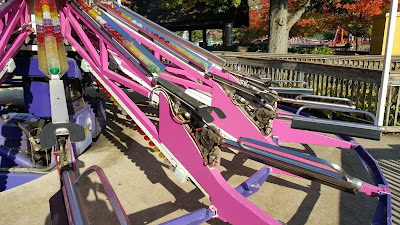 All new track at the bottom of the first drop. While we might be running out of time for painting and carpentry work, another project is just getting underway. Wally Bear says he has a splashing surprise in store for 2016! Stay Tuned!